POLK CITY, Fla. — The Polk County Sheriff's Office is searching for at least one dangerous suspect they say is 'capable of murder' after a man was killed inside a Polk City home and another was brutally attacked. Deputies believe that the suspect(s) stole up to 31 firearms. Polk County Sheriff's Office responded to a call at around 1:45 p.m. Wednesday near the 7400 block on Berkley Road after three Good Samaritans noticed a man covered in blood trying to flag down help. The man, 57-year-old Kenneth Maier, of Polk City, told the Good Samaritans he had been robbed. He also told them that there was another victim inside the home. "They ran to his help not knowing what was wrong and then went into the house. They took an obvious risk whether they were clearly aware of that at the time," said Sheriff Grady Judd. When the Good Samaritans ran inside the home, they found 68-year-old William Reiss, of Polk City, deceased. When deputies arrived on-scene, Maier told them that Reiss' 2008 Dodge Ram 1500 2-door, with a Florida license plate Z2SKD with a handicapped logo, was missing from the driveway. The truck has wooden fence rails, similar to siding, on the back and it has shiny rims. Maier was transported to a local hospital and is still in critical, but stable condition at this time. During the investigation, detectives discovered that Reiss collected firearms. 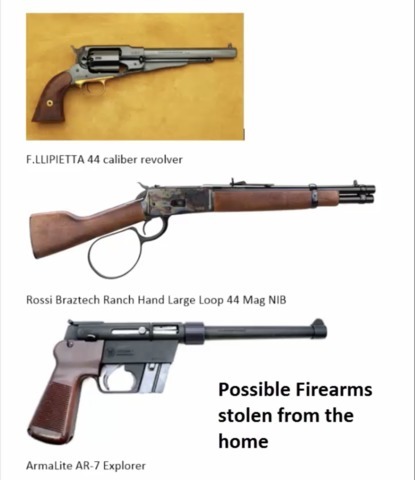 They determined that up to 31 firearms were stolen from the residence; including long guns and pistols. Investigators say Reiss was very cautious when selling firearms and are hoping past customers will come forward with information about other buyers who may have driven a particular car. Approximately 20 minutes before deputies responded to the location, video surveillance from a residence and several businesses on Berkley Road and Commonwealth Avenue North showed an unknown black Chevrolet Sedan (possibly Sonic LT) traveling southbound on Berkley Road and Commonwealth Avenue North minutes before the incident occurred. After the incident occurred, the unknown black Chevrolet sedan (possibly a Sonic LT) and the victim's 2008 blue Dodge Ram 1500 are last seen traveling northbound on Commonwealth Avenue North in Polk City around 1:40 p.m. on Wednesday, January 3. Detectives are trying to identify the owner's/drivers of the black Chevrolet Sedan (possibly a Sonic LT), and still attempting to locate the stolen 2008 blue Dodge Ram. "We have an unknown amount of suspects on the loose with up to 31 stolen firearms. They are dangerous and capable of murder," said Sheriff Judd. "Crime Stoppers is offering a $3,000 reward for information about these suspects. We need to find them before they hurt anyone else." 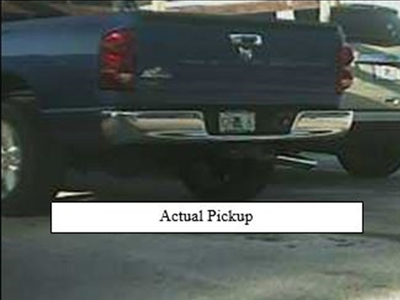 If you have any information about the whereabouts of the stolen Dodge Ram, the identity of those driving the black Chevrolet Sedan (possibly a Sonic LT), or information about this crime, please call us at 863-298-6200. Do not attempt to interact with these suspects - deputies say they are armed and dangerous. Anyone with information about this crime who wants to remain anonymous and be eligible for a $3,000 reward is asked to call Heartland Crime Stoppers at 1-800-226-TIPS or log onto www.p3tips.com to submit your tip via the web. For a secure and password protected mobile app for your smart device, go to the app store and download the free "P3Tips" mobile app. No caller ID, no recorded lines, no tracking cookies, no saved IP addresses.